While visiting Thailand, we wanted to build in a day trip to Ayutthaya and Bang Pa-In Summer Palace. I found the easiest way to do this was to book a private tour from Bangkok to Ayutthaya and Bang Pa-In Summer Palace. I highly recommend booking private tours for any trips in Thailand that require driving a long distance or to places outside the reach of public transportation. Private tours are not that expensive considering the price includes both a driver and a tour guide. We had fabulous guides and learned a lot about the places we visited as well as the country and culture. Our awesome tour guide Rabbit arrived at our hotel while we were finishing our breakfast and hung out in the lobby reading Vogue until we finished. Our driver arrived next and off we went. While driving, we saw Thailand's countryside and rice paddies and were able to observe how people live outside of the city. The first stop on our tour from Bangkok was Bang Pa-In Summer Palace. 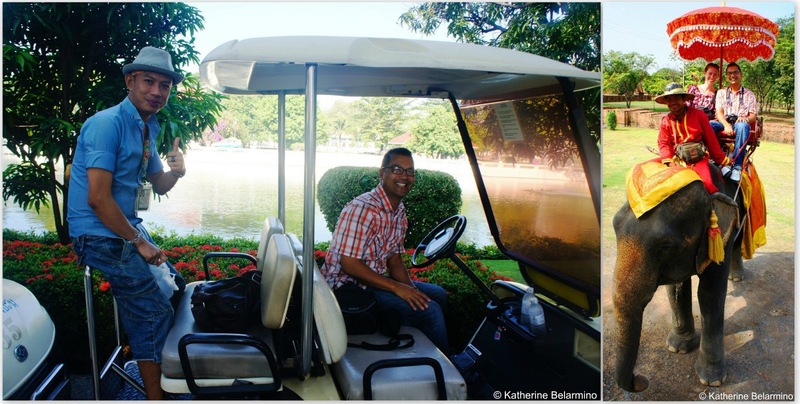 There are two ways to get around the palace grounds: by foot, or by golf cart. We opted for the golf cart, which was a lot of fun, except Romeo sometimes drove a bit too fast for me to snap a well framed picture. The Bang Pa-In Summer Palace complex was constructed in the 17th century, though many of the present buildings were built in the 19th century. The colorful buildings include a Chinese-style palace, a lookout tower (from the top of which is a great view of the structures and grounds), a European-style royal residence, a Thai-style pavilion in the middle of the pond, and a coach house. After our visit to Bang Pa-In Summer Palace we crossed the river by cable car to Wat Niwet Thamaprawat. This Wat is unusual because it looks more like a Christian church than a Thai Buddhist temple. The buildings are bright yellow and white on the outside, and the interior of the temple has pink and white ceilings, black and white tile floors, and colorful stained glass windows. We were able to receive a blessing from the monk while visiting the temple, which consisted of a verbal blessing and being splashed with water. Our next stop was Wat Phananchoeng, which houses a huge Buddha in a barely large enough room. Worshipers purchased orange cloth that was tossed up to men standing on the lap of the Buddha to be wrapped around the image. It was a beautiful sight to see the orange fabric soaring through the air to swathe the shining gold Buddha. Our tour from Bangkok continued on to Thailand's Ayutthaya, established in 1350 as the second capital of Siam (after Sukhothai). Ayutthaya was a majestic city for centuries until it was destroyed by the Burmese in 1767, when the city was burned to the ground. It is now a UNESCO World Heritage Site. There were reminders of the disastrous 2011 floods, as waterline marks were visible on some of the structures. 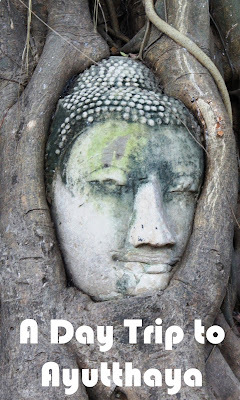 Things to do in Ayutthaya include visiting Wat Phra Mahathat, famous for the Buddha head embedded in a tree’s roots, Wat Phra Si Sanphet, with its three dominant chedis, Wat Ratburana, and Wat Chai Wattanaram. Another attraction in Ayutthaya is Viharn Phra Mongkol Bopit, which has one of Thailand’s largest seated bronze Buddhas. We booked our private tour from Bangkok to Ayutthaya and Bang Pa-In Summer Palace through Oriental Escape. It is also possible to book a personalized tour directly through Rabbit (he can be contacted via Facebook). In addition to a few day private tours, I also booked airport transfers through Oriental Escape. This was especially ideal for our arrival in Bangkok, which was the first stop of our Thailand trip. We arrived around midnight and were met by an English speaking woman with an iPad with our names on it, who led us to our driver who already knew exactly where our hotel was located. This made our arrival very stress-free.